In late January, 2011, the dynamic duo of the Scott brothers announced that they will be producing a TV series for international sales named ‘The Drivers’, a drama based on the 24 Hours of Le Mans during the 1950s and 1960s. Tony and Ridley Scott will join Headline Pictures and Sennet Entertainment to co-produce. The TV show will be based on a book by Sports Car Digest contributor Wallace A. Wyss, entitled SHELBY The Man, The Cars, The Legend. We caught up with author Wallace Wyss and asked him a few questions about the upcoming project. Sports Car Digest: Is this your first sale in the visual medium? Wallace Wyss: I once sold a script for a feature but don’t know if it was ever produced. I was pretty wet behind the ears back then and didn’t know you could option it and have it come back to you if they didn’t start producing it by a certain deadline. SCD: What turned you on to Shelbys? Wyss: It was purely happenstance. I was walking down a street in Detroit and this lady came tearing around a corner in a 427 Cobra S/C and pulled up to me and asked me where the Convention Center was. I said, “If you give me a ride, I’ll show you.” I jumped in and we proceeded there, at a ferocious pace, and I met Shelby and Phil Remington and others in his crew, who were preparing for the Detroit Auto Show. The lady, named Pat Merone, was part of the entourage. So from that moment on, I was hooked and began to collect information. Later I visited the Shelby plant at LAX when they were still in business, before they moved Shelby production to Michigan. SCD: How did the book SHELBY The Man, The Cars, The Legend come about? Wyss: Almost 40 years ago-–back in 1977–I wrote a book called Shelby’s Wildlife: the Cobras and the Mustangs. I think up until then only Shelby had written a book on the subject, The Cobra Story, but there was soon a small book called the Cobra Guide by Bill Carroll. My book “owned” the market for a few years until the Shelby club began producing their own books to compete with it so finally it went out of print after 17 years and 50,000 copies sold. SCD: So why did you write an all-new book instead of revising the old one? Wyss: I kept thinking that the old way of writing car books was becoming history because of the internet. Today, if you want to know what size the carb was on the ’65 Shelby now you just type “65 Shelby carburetor” into Yahoo and in seconds you find out so you no longer need to have articles with all the specifications. Now to me the important thing is the big picture–to answer background questions like why Ford Motor Company shelled out $25,000 for Shelby to make the first Cobra or why Henry Ford II wanted to go racing at Le Mans? Turns out in the latter case because he had an Italian girlfriend and wanted to impress her that Ford could compete against Italy’s best. SCD: Did you use any book as a model? Wyss: Yes, indeed. I used the book by Brock Yates called Outlaw Machine, about Harley. Yates doesn’t go into lengthy explanations of panheads vs. shovelheads but talks about why Harleys are so eternally appealing. So that book was my model on the angle of approach. Also from the cover of another of his books, called Against Death and Time One Fatal Season in Racing’s Glory Years I got the idea of having a picture of several race drivers because when you see a group shot like that, it intrigues you—you wonder who the hell are those guys and what happened to them? In my case I found a group picture of Shelby drivers at a swap meet, and paid $50 for it and it shows four drivers with Shelby, three of whom later died at the wheel. That one picture says it more than anything—you could get killed in endurance racing. It was a glorious sport but dangerous as hell. SCD: Well, Yates was called “the assassin” so did you model your opinions in the same style? Wyss: SHELBY The Man, The Cars, The Legend was an unauthorized book in that I did not promise to go to anyone for approval. My opinion is that, if you are writing such a book seeking approval of some official source, you might as well be paid by the PR staff for doing a puff piece and call it that. I called a spade a spade here and there because, in the long run, that is the only way you are going to be respected. Too many car histories sound like canned histories written by the automaker. And, truth be told, after 40 some years, I think it’s OK to reveal some secrets like the Daytona Cobra had a subframe that was in addition to the regular frame and they didn’t tell the FIA about that when they ran it as a rebodied Cobra. SCD: So is the TV series going to be a bio of Shelby? Wyss: I don’t know, I haven’t seen a script. But I think by reading the production companies’ descriptions, the only thing you can be sure about is that it’s going to be a drama about racers, and they could be real people depicted or fictional characters, basically whatever they want. When a production company buys a book, it’s only a kick off point and the buyers go on from there and sometimes never get back to the author to ask if he or she likes the direction they’re going. I hope I can go to where they are filming though, just for kicks. SCD: So what are you working on now? Wyss: Well, when I got the news last week that the Scott brothers were cinching the deal, I was in the throes of finding an agent for a new series of novels I am writing, all featuring a detective that operates in the world of collector Ferraris. I’m hoping that the TV series sale will increase the chances of an agent taking on the new book because I think collector Ferraris are a hot topic. If you want proof of that go to Pebble Beach this August when they roll out at least twenty 250 GTO Ferraris, worth upwards of $15 million each. SCD: Did you employ an agent to sell the SHELBY book? Wyss: No. The producers must have seen it reviewed in a magazine and bought one and decided it had what they needed to start the ball rolling. One of the Scotts has even been quoted as saying, when he grew up in England, Stirling Moss was one of his heroes. They went direct to my publisher and optioned it for awhile and then only recently decided to go ahead and buy it. Series like that are pre-sold in various countries and you can bet there is interest in several countries because there will be characters depicting drivers from various countries—Australia, the UK, New Zealand, Italy, France and the U.S. to name a few. Each country’s race fans will probably be rooting for the driver from their own country. SCD: But your book was mainly centered on the Americans? Wyss: Shelby’s team was from an American company but his drivers came from all over the world. The significant drama in the middle of the book, for fans of mid-‘60s racing, is that Ford, a giant company, went up against Ferrari, a small company, but one with a string of victories at Le Mans. Ford beat them so bad that Ferrari has never won Le Mans since. SCD: How do you portray Enzo Ferrari? Wyss: Once again I have to cite a Brock Yates book Ferrari: the Man and the Machine. In that book, Yates earns his “assassin” nickname once again because he does a real job on ol’ Enzo, showing him to be Machiavellian, vain, pompous and conniving. But one has to admit that he built some great cars, in fact in one passage I quote Carroll Shelby describing the 1965 24 Hours of Le Mans race where a beat-up privately entered Ferrari beat the factory Fords and Shelby is praising the Ferrari’s performance. I would love to see who they decide to cast as Enzo. Maybe Anthony Hopkins would be good? And for Shelby I’d like to suggest Gary Busey, who I met back when he got his first movie role. SCD: We have profiled you as an artist before. Can you explain how that transition came about? Wyss: That career came about by accident. 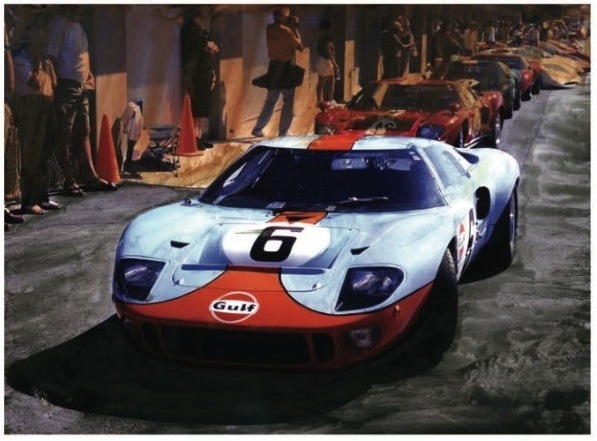 In 2007, I did a painting of Shelby to promote a book I co-authored called Ford GT40 and the New Ford GT and someone bought the painting and then I thought, “If I do more, I had better make prints,” and subsequently found a print shop. So now I paint my favorite sports cars and make prints available through www.Albaco.com. There’s a good many Cobra and Ford GT40 prints featured on their website and now I’ll be switching to depicting my favorite Ferraris in anticipation of the Ferrari detective books. SCD: What else are you doing with your time? Wyss: I am still reporting, mostly for websites. And also my family has a ranch, which I call “Cobra Ranch,” which an uncle homesteaded in Mendocino before the war. I go up there to write and paint. In Southern California I am learning a little about horse breeding and even had to sell a horse recently to keep bread on the table while writing the novel. I hated to sell that magnificent bay gelding, 17 hands high, but the truth was he never wanted to finish higher than fourth so he had to go. He has a new career as a show horse. SCD: Are you collecting any cars? Wyss: I’ve been through Porsches, Ferraris, Mercedes Gullwings, Iso Grifos and all that but am too busy to restore a car. I might start looking for “barn find” Ferraris though, when the Ferrari book comes out, as that is the subject of my novel. 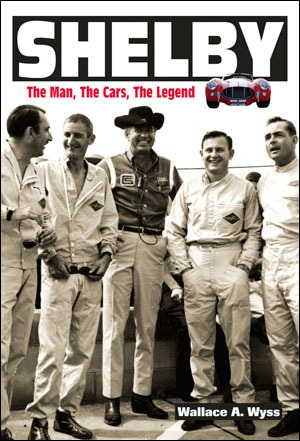 SCD: Where can we buy a copy of SHELBY The Man, The Cars, The Legend? Wyss: Try the publisher, Iconografix, at 1-800-289-3504 or you can order it at any bookstore like Barnes & Noble, Borders or Amazon. FremantleMedia Enterprises (FME), the commercial and brand extension arm of FremantleMedia, announced that Scott Free Inc. has joined Headline Pictures, Sennet Entertainment and FME on The Drivers, a series based on the high-octane 24 hour motor race in Le Mans during the 1950s/1960s. Ridley and Tony Scott will be co-producing the drama with Headline Pictures and Sennet Entertainment; FME is funding the project as part of their global drama strategy to develop and package drama series for the international market. The series is based on the book, Shelby: The Man, The Cars, The Legend written by Wallace A. Wyss and optioned from Iconografix. It tells the true story of wild young drivers from the US, Germany, France, Italy and Britain, friends and rivals, amateurs risking everything for a shot on the tracks. FremantleMedia is one of the leading creators and producers of entertainment brands in the world. FremantleMedia is part of the RTL Group, Europe’s largest television and radio broadcast company, which is in turn 90 percent owned by Bertelsmann AG, one of the world’s major media and entertainment companies. FremantleMedia’s worldwide production arm is responsible for many of the world’s highest rated prime time entertainment, drama, serial drama and factual entertainment programmes. FremantleMedia Enterprises is the brand extension arm of FremantleMedia, offering a one-stop-shop for all Licensing, Distribution and Home Entertainment around the world. The FremantleMedia Group (which includes FremantleMedia North America, UFA, talkbackTHAMES, FremantleMedia Australia and Original Productions amongst others) has operations in 22 countries, one of the most comprehensive global networks, creating nearly 10,000 hours of programming a year, rolling out more than 60 formats and managing over 300 individual titles. FremantleMedia has some of the world’s most sought after and long running formats in its catalogue, and globally, produces such programmes as: Idols (co-produced with 19 Productions in the US), Hole In The Wall, Got Talent (co-produced with Syco in the UK and the US), The X Factor (co-produced with Syco in the UK), Take Me Out, Family Feud, The Price is Right, Farmer Wants A Wife, Gute Zeiten Schlechte Zeiten, and Neighbours. I had to check the calendar to make sure this wasn’t an April Fool’s joke. Please, please, please make this TV show and make it GREAT. This is definitely something to look forward! Can’t wait! Many of us in the car world are looking forward to this. We all need a respite from incessant cop dramas and the “I wanna be” shows! Good luck with the project – let’s hope it makes it to the screen by next fall! Thanks for your comments on the state of books vs. the Internet. I think that there is still quite a market for books that grab the inside story about significant cars and the personalities behind them. So much of what is on the Internet is poorly researched and badly written, to boot. I have a copy of Shelby’s “Cobra Story,” and am going to check out your book. Best wishes for success with your novel. Finally, a proposed show for TV that is based true reality, not some trumped up entertainment carnival show! Please, PLEASE make it happen! Can’t wait to see the TV show…when pls? I sure hope they get the FACTS just dah FACTS. …. I’ll watch anyway .. for a while. Hell, Ole’ Shell actual life is made for TV movie of the week. The Holy wood folks will not have to make anything up regardless, because this incredible Americas success story sells itself, it just don’t tell itself. Thats Hollywoods domain. Get the folks who did the “Victory by Design” series… (Brits). To write the screenplay and produce.. Then you’ll have a winner.